As a student and a vegan in Grahamstown in the eighties, one of my favourite treats was a bowl of samp and beans (without gravy) for 80 cents at a hole-in-the-wall workers’ café called the Eyethu Coffee Pot at the bottom end of High Street. I still have the photograph I took of a little girl taking a pee outside on the pavement next to the chalkboard with the specials. Workers from nearby construction sites and temporary labourers (earning R4 a day from public works) filled the tables, drinking ginger beer and eating with plastic spoons. It was always extremely convivial. Only a block from the Grand Hotel, yet nobody from the white town ventured inside. And it was by far the cheapest lunch in town, and one of the tastiest. There is a bourgeoning township restaurant business, still driven mostly by locals and few tourists. These places are cheap and cheerful; the atmosphere is terrific, and the food is let us say, hearty. 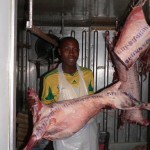 Most are tshisa nyama establishments, literally meaning “burning hot meat” or braaivleis. They consist of a butchery, where you order your meat, a barbecue section (usually out of sight), where the meat is roasted on log-fire coals, and an informal eatery, with wooden benches or plastic chairs and tables. 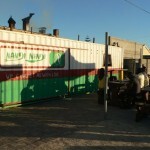 Many locals also use the braai service for takeaway. The merits of such an establishment depends on the way the hosts treat their guests, the aptitude of the butcher (meat is usually very fresh; no dry-aged, maturing steaks here), and the skill of the braai chief. These fellows (I didn’t see any females barbecuing at any of the five tshisa nyama places I visited) all have their nifty secret ways gleaned from braaing all day every day. They put most braai ooms to shame the way they rotate and juggle the coals, judge the readiness of the meat, and then of course each has their trademark marinades and spice rubs. The best type of wood to burn is also hotly debated. Beef is available in a great variety of cuts, while boerewors and chicken pieces are popular; lamb comes at a premium. The butchers usually have a large offal section, but sheep’s lungs and the like are not normally barbecued. Accompanying dishes are umngqusho (samp or coarsely ground corn; what the southern States use to make grits), white pap (mielies-meal porridge, available cut in slabs on Styrofoam palettes), amagwenya (vetkoek) and chakalaka (a truly South African relish of onions, garlic cloves, green pepper, chillies, curry powder, carrots and cauliflower, and tinned baked beans in tomato sauce). 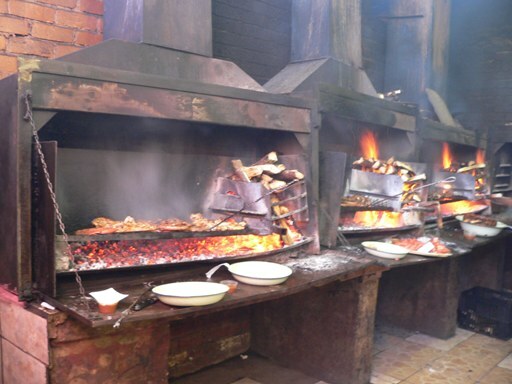 Probably the best known of the smokehouses is Mzoli’s in Guguletu. It’s well-branded and surrounded by stand-alone ATMs. They even had their own house-labelled Merlot and rosé. People mostly bring their own booze or buy from the nearby bottle store (there is no corkage charge). Jamie Oliver featured Mzoli’s as his magazine cover story last year, eating off metal plates and dishing from enamel basins. You can eat well here for R50. The place is pumping with activity, especially weekends, when expensive cars line-up outside. He has attracted a healthy diversity of people and an overseas tourist trade. Just turn up after midday; there is no point in phoning ahead. More relaxed place(and almost exclusively local)is Nomzamo’s in Langa run by the charming Viki Mangaliso, who also plays of all things that eccentric instrument, the harp. Perhaps the first thing that strikes one is the photo of Che Guevara in the butchery. Nomzamo’s has the best vegetarian options among the tshisa nyama places, including sandwiches and salads. Lunch for two (eight chicken wings and two steaks) came to R53. Profit margins here are leaner than the fat on the bone. Some policemen nearby were having the “chill and chow special” – a loaf of bread and 1,5 litres of Coke. Alcohol is strictly banned from the premises. Also in Langa is Kool, a bar that offers thanks to its customers by giving a free tripe and fish braai on Monday afternoons. This will be a fantastic place to watch Bafana Bafana in action. In a completely different vein are restaurants such as Naledi’s Kitchen in Guguletu, just opened by singer Mpho Moteane (of Mpho and Uvimba Band), and Kefu’s jazz pub and grill which has been around since the 1990s in Khayelitsha. Also orientated to the township tourism market is the Mzansi Restaurant, owned by Nomonde Siyaka and her husband Vukile who also teaches tourists dancing township style. Nomonde showed me a delightful slideshow on her computer of a recent group of Swedes. 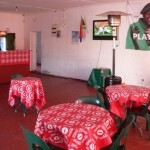 They cater for up to 120 diners, and the full buffet is only R120 a head. I’m quite surprised to learn that most visitors want to eat Western food – broccoli and cauliflower in mustard sauce. It seems you can take tourists to the township, but you can’t make them eat tripe. She serves free-range chicken on the coals, beef and lamb stews, lots of roasted root vegetables. 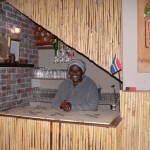 She only serves a few African dishes, such as umfino (food with leaves; in this case pap mixed with spinach and leaks). “Most tourists don’t want to eat something they don’t know or understand,” she says. Nomonde is also quick to add that she has car guards at night, and there is a nearby parking area for coaches. The dining room is beautifully appointed with wooden chairs and designer furnishings. Clearly, a heavy investment has been made. 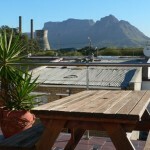 Upstairs there is a patio with a fantastic view of Table Mountain and in the foreground, Cape Town’s beloved but doomed decommissioned cooling towers. Don’t let the chronic lack of development and the shocking neglect of Cape Town’s townships put you off going. If you are still hesitant, numerous companies run township tours, and specialist operator Coffeebeans Routes runs a Township Cuisine Route(www.coffeebeansroutes.com / Tel: 021 424 3572). Nandi Nandi, Spine Road, just after the Look Out Hill Complex, Khayelitsha. No numbers. Best time is from mid-afternoon. Published in the Mail & Guardian, 18 June 2010.